David Powers King: A to Z Challenge: Beyond Two Souls "Jodie's Suite"
A to Z Challenge: Beyond Two Souls "Jodie's Suite"
A recent favorite from the hit game Beyond Two Souls, this track left me feeling all mysterious and haunted by the unusual life of Jodie Holmes as she has to deal with a paranormal entity ever since birth. I enjoyed the game (review to come someday), but I loved the score by Lorne Balfe and Hans Zimmer even more. This is a great track to write with. I hope you enjoyed the track, and thank you for stopping by. I'm David, and cinema games are getting better and better! Definitely a Japanese influence in that score. Not much of a gamer, but LOVE this music. My husband is a big sci-fi fan and I'm a big fantasy fan, so I'll be watching your blog a lot to see what we should watch for. P.S. I joined your blog as a follower, but for some reason today my picture is not showing up when I join the blog. So that little generic face listed in your followers is me. Truly haunting. This is one I wanted to play. Can't wait for the review. Alex is right -- a true Japanese flavor -- I like the music to the second GHOST IN THE MACHINE animation -- INNOCENCE. Very Enya-like. Thanks for following my blog! Oh, that's lovely and haunting. Thank you for introducing me to it! I love Japanese music, and really enjoyed this one. Thank you for sharing it with us, David! Oooh, I liked this. I'll have to save it somewhere for a second listen. This music is fabulous, very haunting, especially the single female voice that opens the piece. I can see myself writing to this. Thanks for the rec. I enjoyed that. Good pick. I don't listen to music while I'm writing but I love listening to music otherwise and making playlists. Hans Zimmer is a modern John Williams the way he writes memorable music. Love it! I love that your bio says "nonstop author." That is perfect. Thanks for visiting my blog today. I hope your month is wonderful. Nice song. I always loved that game. 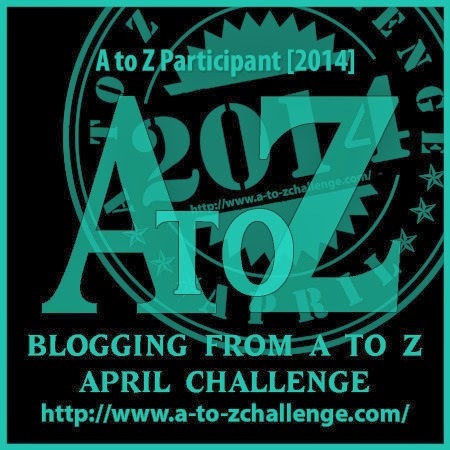 I love your theme for A to Z! When I played the piano, I would always bring in sheet music from Final Fantasy and ask my teacher to teach it to me. . Great song choice, by the way! I'm definitely a gamer, but have never tried this game! So you do game reviews too? That is something I've told myself for years I would do and just never seem to get around to it. Ooohhh, love the music. A kind of LORD OF THE RINGS vibe. I just picked up RUMP from the school book fair. Can't wait to dig in. Thanks for popping by my blog. Happy A to Z - ing. Nice choice of music, David. I don't dare try out any of the games for fear of getting addicted...I had enough trouble breaking my Minesweeper habit. But sound tracks are a whole different ballgame. I like it. I'll look into this group. Meanwhile, check out Two Steps from Hell. Excellent band. very nice to listen to your music of the day while readin others blogs- thanks ! I haven't heard of this game, but I'm listening to the song right now. :) Sounds beautiful.